Iron Chef Morimoto came to F&W's test kitchen last week to show us his signature fusion Asian dish: Buri bop. Here are his tips for buri bop done right. Last week, Iron Chef Morimoto came to F&W's test kitchen. Beyond his esteemed television career, the renowned chef also owns 10 restaurants all over the country. He came to show us buri bop—his take the classic bibimibop (see more on that below) from his restaurant Morimoto Asia, in Disney Springs. 1. Bibimbop literally means "mixed rice." It's a traditional Korean dish that is typically topped with vegetables or meat. Since Morimoto is a sushi chef, he wanted to put a raw fish spin on this classic. That's why he created the Buri bop, which uses yellowtail instead of beef. 2. "Buri" is one of the many names for yellowtail, which call also be referred to as hamachi. In Japan, you can get hamachi that is wild and much larger than the typical farmed variety, and that is considered "buri." In America, we typically get smaller, mostly farmed hamachi, which we call "yellowtail." Between Tokyo, Osaka, and America, there are over nine different names for the same fish. But Chef Morimoto prefers to use buri for this dish—hence the name, "buribop." 4. You can always make a dish seasonal and local. Morimoto's buri bop is made with a laundry list of flavorful ingredients that create the perfect balance. In this variation there was: rice, buri, garlic-soy jus, sesame oil-marinated spinach, marinated fennel head ferns, pickled daikon and carrots, an egg yolk, yuzu pepper, and finely shredded nori. The roasted ferns were a great way to tie in local produce to an international dish. 5. There is a method to mixing the Buri bop. First, you place all of the yellow tail directly onto the bowl to achieve a beautiful, one sided sear. Then, you use two spoons to mix the yolk throughout the bowl, creating a velvety texture that cooks the egg all the way through. Place the yellowtail back in the middle so it doesn't get overcooked and enjoy with a Shiso-Jito in hand! 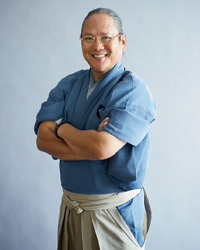 Iron Chef Masaharu Morimoto demonstrates the proper way to cut and plate sushi.